This is not a review on a new recording by German band Winterblood, you know, the one that gave pleasure (or irritation?) to the Black Metal scene with their 2013-album Herbstsehnsucht. That album was released via French label Le Crépuscule Du Soir Productions (at this moment having a break, apparently??? ), and the funny thing is that this very same label also released something from another act called Winterblood: Anelli, 2014. And it’s the latter, the Italian project Winterblood, that I refer to. 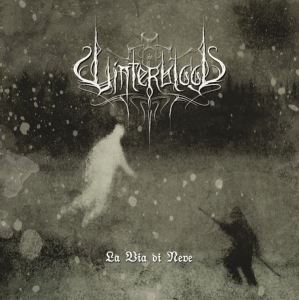 In a couple of days / week I will publish a review for another Winterblood album, Culti Segreti, but their current label, the fantastic Moscow-based Frozen Light, did also release a ‘lost’ album, La Via Di Neve (‘the route of snow’). Actually, the five compositions on this album were created in 2013, but it took until now that the audience can have the pleasure to experience them. Pay attention, for there were only 300 stamp-numbered copies available and I think it might be close to the terrible ‘sold-out’ status. La Via Di Neve deals, like the title suggests, with winter, snow, freezing cold, icy winds, and related to it: loneliness, despair, emptiness and depression. Check the sober and integer yet specific artwork (courtesy of Apocalyptic Moon) (I am not sure, but I guess Frozen Light’s preferred visual art-provider Olga Matveeva is involved within the layout duties) and you’ll have an idea of the outcome too. This album is nothing less (so, it is much more???) than a collection of grandiose, and I do really mean ‘grandiose’, Dark Ambient-alike soundwaves in the vein of, well, everything in between Sieghetnar, Nebula VII, Vinterriket, Symbiosis, Thy Veils, Sembler Deah, Moloch and the likes. The compositions are like lengthy, stretched-out aural floats, ambient soundscapes that permanently carry your spirit away to unknown, unexplored places, far beyond the conscious. It’s like a mixture of organic field recording-inspired soundwaves at the one hand, and deep-emotional, introspective Ambient majesty at the other. Not only because of the lengthy duration of each composition, yet also because of the oppressive atmosphere, the whole album is like a journey through the inner self, at least if you’re willing to open yourself for such flair. No matter if you’re searching for the beauty of light (imagine a unicorn running fearless on a wide, peaceful field) or the melancholy of life (are you crawling in a dark corner of a cold cellar, deprived of light and joy? ), you will come back, again and again, to the essence of Winterblood’s sonic esoterism. Long-form waves of ethereal sounds, journeys through inner dimensions far beyond the Inner Eye. Despite my divine adoration for (most kinds of) Funeral Doom and Black Metal, I deeply adore this kind of Aural Art. It expresses same-minded feelings, it exhales a comparable emotional truth, and it gets defined via sonic majesty that challenges the listener in order to create an own world that might fit to the means behind this fabulous creation. Or in short: superb!